Pizza Hut has introduced the Pie Tops, a style of shoe that allows wearers to order pizza by pressing a button on the right shoe's tongue. Want to see a taste of the future? How about shoes that order your pizza for you. 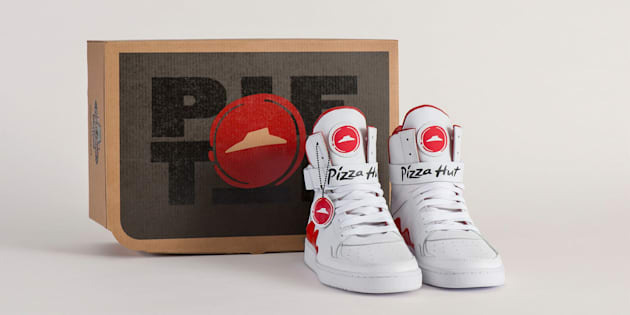 This cheesy technological advancement is being delivered by Pizza Hut in the form of a new type of sneaker called the Pie Tops. A button on the tongue of the right shoe connects with a mobile app on the wearer’s phone. This allows them to instantly submit a pizza order wherever they are standing or sitting ― just by pressing the tongue of their shoe, according to a press release. The first time a customer uses the app, they have to plug in their address, payment info and their default pizza option ― otherwise, you’re getting a Large Supreme Pizza. Shoe wearers do get a limited choice of other large pizzas as well, which they can see by clicking the button on their shoe and looking at their phone. Better do stretches first, since bending over to touch the shoe tongue might be the most exercise some Pizza Hut customers get all day. Does this pizza, er, piece of the future have you kicking up your feet in joy? Now comes the buzzkill: Only 64 pairs are being made, the same number of teams in the NCAA Basketball Tournament. Most of those pairs are being handed out as promotional items, but a Pizza Hut spokeswoman promises a few will be available to the public later this month. This is the latest technological innovation Pizza Hut has attempted that has nothing to do with improving the quality of their pizza. Last year, the chain’s British branch introduced a cardboard box that doubles as a DJ unit.